Hebraist and Talmudist; born at Belgrade about 1620; died at London toward the end of the seventeenth century. He was descended from an old Spanish family which had settled at Belgrade several generations earlier. Having received an excellent education, he became the secretary of Joseph Almosnino, rabbi of Belgrade. When Belgrade was taken by Prince Max Emanuel of Austria (Sept. 6, 1688), Danon, with the greater part of the Jewish community in that city, was exiled. He maintained for some time a precarious existence in various Moravian towns, dependent sometimes upon public charity for food and shelter. He finally wandered to Amsterdam, where he received aid and protection from the Mæcenas of Jewish learning, Joseph Ẓarfati. 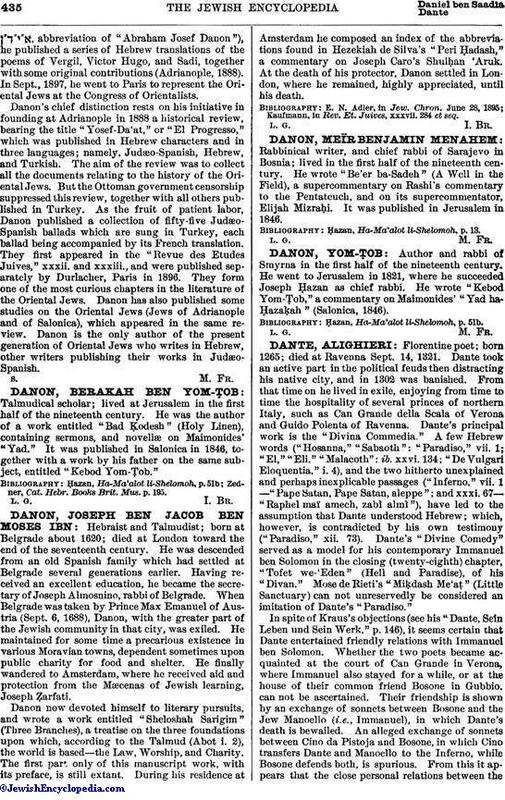 Danon now devoted himself to literary pursuits, and wrote a work entitled "Sheloshah Sarigim" (Three Branches), a treatise on the three foundations upon which, according to the Talmud (Abot i. 2), the world is based—the Law, Worship, and Charity. The first part only of this manuscript work, with its preface, is still extant. During his residence at Amsterdam he composed an index of the abbreviations found in Hezekiah de Silva's "Peri Ḥadash," a commentary on Joseph Caro's Shulḥan 'Aruk. At the death of his protector, Danon settled in London, where he remained, highly appreciated, until his death. Kaufmann, in Rev. Et. Juives, xxxvii. 284 et seq.